Today I finally received my Magic Box controller adapter for my original Xbox, and with it so begins a revolution in the way I play games. Because now, dear readers, I can use the most beautifully designed controller in the world, the Japanese Saturn pad, with one of the world’s ugliest consoles, the Xbox, to play Super Nintendo games! WARNING: this entry contains satire. Yes, because everyone has the money today to buy rare, out of print CD titles which cost triple figures, for DEAD hardware, off people on eBay, instead of downloading them. Well done that man, well done all round. Mednafen, god bless it, is a simple LOAD AND GO type of emulator. It’s my kind of emulator. Unfortunately I’ve been finding the Xbox controller somewhat uncomfortable – my hands are those of a poet or pianist’s, unaccustomed to the lumberjack-styled designs put forth by Microsoft (seriously, what is with Western pad design? The Saturn pad was crazy chunky, as was the Xbox’s! Too much red meat in the designers' diets methinks). The Japanese Xbox pad is an improvement, but jeez, it’s still a little too unwieldy for my refined bone structure*. What I wanted was to somehow use my USB Saturn pad. It turns out there is a mod to install a USB slot in a chipped Xbox, but it apparently only works under Linux for things like a keyboard. So I was told. Thanks to Xbox Scene for the image. But then someone pointed out the Magic Box to me, a device which allows you to plus Saturn, DC or PlayStation controllers into your Xbox. I absolutely had to have one. Unfortunately all online which once stocked it are now sold out, since it’s quite old. But I found one of eBay. Sadly I big $65 dollars and was outbid at $66, and there wasn’t another in sight. So I put a reward on a UK forum: £35 to the man who posts me a Magic Box. Within minutes I had a reply, wired the PayPal funds over, and now I have it. The Engrish on the front is priceless. While inside is a series of exotic fliers with enough cool-looking Chinese characters to make you think you were in Bladerunner or something. At first, reading the instructions, it implies that the L and R buttons on the Saturn pad are disabled, which disappointed me, but upon loading several emulators I discovered they do actually work, and are mapped to the L and R triggers on the Xbox, albeit reversed. Which is fine, since using the configuration utility in the emulators now allows me to remap the perfect SNES, Genesis, NES, Turbo Duo and other emulator system. As for the PS1 emulator, which is also great, I can just use an original PS1 controller, or stick with the Saturn pad. I’ve spoken about my love for the Saturn pad many times before, but it really is the best digital specific pad ever made – as are the USB versions they made for PC (my USB Saturn pad is by SLS). Plus, if you get a black USB Saturn pad, it matches your PS3 (I play all non-analogue PS3 games with the Saturn pad, such as the new Scott Pilgrim game). What I like is how well designed the d-pad is, besting even Nintendo’s original d-pads, with finer diagonal control. It also has 6 face buttons, more than any other pad except the Genesis revision. It also has 2 shoulder buttons which, despite not being analogue, have a seriously nice CLICK to them (the quality of click differs from the USB pad, and I’ve heard that fighting enthusiasts actually prefer the original Saturn pad’s click). It lacks a Select button, which is mildly annoying, but otherwise it’s damn awesome. The PlayStation brand of pads comes a close second, let down only by a poor d-pad, but is otherwise my favourite for analogue sticks. The N64’s broke to easily, the Dreamcast’s came loose (though it did have better analogue triggers), and the 360 has its sticks in a non-symmetrical fashion which disorients me quite badly. Now I have the best of both the Saturn and the PS2, for all my digital and analogue controller needs (unless I need some good triggers, in which case the DC can be used). Click the below image for how the buttons are mapped. Seems to me HG101 hates being a widely-read website! Why do you chastise your readers for the sin of reading what you post? Woah, you got the XBOX Whale controller there! Don't worry, everyone out west thought it was WAYYY too big and they discontinued production of it after a year or two for the smaller Japanese version. They must have used NBA basketball players to test out the controller in the design phase, assuming everyone in North America stood over 6 foot 6 and had giant hands. I always hated the 4 button layout on those controllers, they formed a kind of diamond shape instead of a turned square always having to look at the controller in order to access the B and Y buttons as I'd miss them completely. That and the 'jellybean' shape of the buttons didn't help either. More games need more FULLY customizeable controller setups. I enjoy the Xbox S controller. It's a great thing. Strangely, I think the giant Xbox controller is GREAT for Halo. Something about its size just made me more accurate for sniping. We didn't call it the "Duke" for nothing! What? You'd be surprised how many PCE games are in the triple digit range; it's kind of sickening. I wouldn't say emulation is perfect for any of those emus on the Xbox. It's not bad, but certainly not perfect. IIRC, the Xbox's controller port was basically a USB 1.0 port, with a few of the wires swapped around and an extra wire added for a light gun. 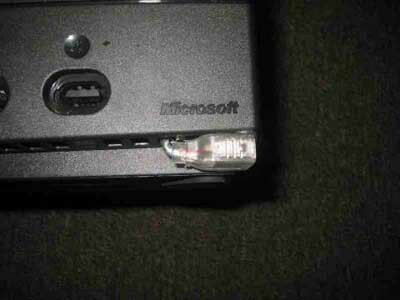 On some forum I browsed a few years ago, there was a guide that involved creating xbox-controller-to-usb or usb-controller-to-xbox adapters by hacking apart controller cord extenders. It might have been a bit of work, but to anyone interested in using authentic controllers on the Xbox, it could save you quite a bit of money (I'm sorry, but £35 is ridiculous for a few bits of wire). On another note, I'm actually quite fond of the Controller S. From a few years back, I've got quite a few fond memories of playing various emulated games with that thing. Sure, it's not a perfect setup for 2D games — the shoulder buttons are analog, the white/black buttons were too awkwardly positioned to be used as fifth and sixth face buttons, and the available face buttons' rounded shape can be a little uncomfortable after a while, but it still gets the job done, and the dpad isn't bad either. Plus, all of the extra unassigned buttons could easily be mapped to various emulator functions, one advantage over the original controllers. As a final comment, although I haven't tried out the PC version of Mednafen, I've been told that Ootake is the best PC-Engine emulator around. The sound synthesis, for one, is much better than the old version of Magic Engine I had for a while. I know this is an old post...but there's one on eBay and I'm debating on putting up my adapter, too.